In order to diversify and widen the scope of weaving, in 1962 Ramses introduced cotton weaving into the workshop. For this method the cotton threads used are very fine and the vegetable-dying method very slow and complicated. In spite of its novelty at the center, the children did not take to the new technique easily and the experiment lapsed. Only two of the original cotton weavers continued working while the remainder returned to wool weaving. death that his daughter Yoanna decided to expand this method. Continuing with what her father had earlier started, Yoanna describes her role with the second generation cotton weavers. "When I went to work at Harrania after my father's death, I decided to revive the cotton weaving with a group of 15 children who had no parental links with the previous ones. They were happy to take part in the school and accepted more readily the difficulties of the technique. They even felt a certain pride as they were no longer considered an appendage to the wool weavers, but rather a new group with its own identity. 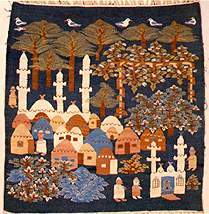 What is also remarkable to note is that I often found in their tapestries details reminiscent of the ancient Coptic fabrics, which of course, they had never seen." The difference in the two types of weaving becomes clearer here. The technique of cotton weaving calls for different and perhaps more difficult skills than high warp, wool weaving. in cotton weaving the looms are horizontal opposed to vertical and the threads are very fine. As a result, the image takes longer to appear. In fact all phases of the work take greater patience and perseverance. Even the dyeing process is more demanding since cotton does not take natural dyes easily. The reward, however, lies in the result. This method produces weavings of great intricacy and clarity. The fact that a ten year old boy soon mastered the technique providesfurther evidence of Ramses Wissa Wassef's original theory concerning our natural gifts of creativity.